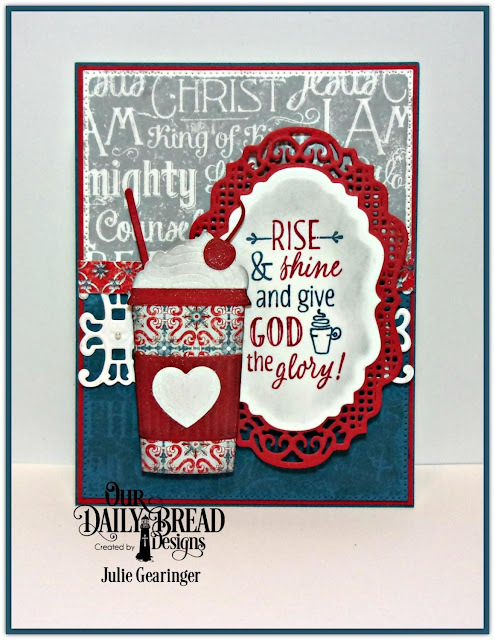 Today I am sharing another Mixed Media card featuring the ODBD Rise and Shine Stamp Set with the new ODBD Beverage Cup Dies from the ODBD September 2016 Release along with the ODBD Chalkboard Word Collage stamp and other ODBD Dies from previous releases. I love this sentiment from the ODBD Rise and Shine stamp set- "Rise and Shine and Give God the Glory!"!! So perfect that He should receive the All of the Glory, not me... for without Christ, I can do nothing! I have incorporated a few of my favorite online challenges in the design- the Word Art Wednesday #248-#249 “Anything Goes” Challenge, the Retro Rubber RTS47 “Anything Goes” Challenge (the ODBD Chalkboard Word Collage stamp is several years old) and the Alphabet Challenge “O for Oval” Challenge. 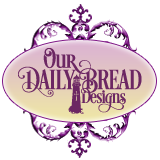 In addition to the gorgeous galleries at the challenge sites, if you have not had a chance to stop by the Our Daily Bread Designs Blog yet, I encourage you to do so- fabulous inspiration from my Design Team “Sisters” (affectionately known as the “Breadbasket” or “Breadsticks”). Die cut and emboss a piece of white along with a piece of denim cardstock with the ODBD Flourished Star Pattern Die, cut both pieces in half and stamp the ODBD Chalkboard Word Collage stamp with a soft gray ink onto the pieces. Mount the two panels onto a piece of cherry red cardstock, trim and mount onto the denim card base. Die cut and emboss a piece of white cardstock with the ODBD Trellis Die and adhere to the card front. Add a strip of the red patterned paper from the ODBD Americana Quilt Collection 6x6 Paper Pad to cover the seam (I used a piece of scrap from my stash :-)). Ink the sentiment from the ODBD Rise and Shine stamp set using the omitting technique (I used a cherry red and denim blue water-based marker), “huff” onto the stamp to re-moisten the ink and stamp onto a piece of white cardstock. Die cut and emboss the sentiment panel with the ODBD Vintage Labels Dies and use the die to sponge light gray ink over the center area. Die cut and emboss a piece of cherry red cardstock with the ODBD Vintage Border Dies, center and adhere the sentiment die cut and mount onto the card front with dimensional foam. Cut and emboss the coffee cup components with the ODBD Beverage Cup Dies- I used the ODBD Americana Quilt Collection 6x6 Paper Pad for the coffee cup, cherry red cardstock for the cup wrapper, lid, straw and cherry and white cardstock for the foam and heart. Assemble the cup and sponge light gray ink over the edges. Mount the assembled coffee cup die cut to the card front with dimensional foam and finish off the card by applying shimmer to the heart and foam with a clear glitter pen (it is so hard to photograph this but the shimmer looks great IRL) along with a pearl to the center of the ODBD Trellis Die. I hope this card has inspired you to dig into Rise and Shine and Give God the Glory as well as create something with the talent He has given to you :-) Thanks again for visiting- hugs and have a blessed week, my friends! Thank you, Julie, for sharing this heartfelt card with Retro Rubber. Wonderful details and textures. We always enjoy seeing you in the Retro Rubber gallery!! Love the warm colors you chose for this beautiful card! That Frappuccino sure looks good enough to eat! Thank you for playing along with our challenge at Retro Rubber and hope you will join us again soon. Love your card, I love coffee related cards! Thanks for sharing with Retro Rubber. Hi Julie! Adorable card! I love the colors and that ode to the holidays! I adore that sentiment! And the song is in my head now! Love that! Thanks for joining us at Retro Rubber!! I love your sentiment highlighted by nice color theme and awesome die-cuts. 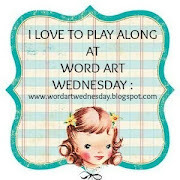 We are so blessed of you joining our Challenge at Word Art Wednesday and hope you'll join us again in the new Challenge that started today. Leaving you with the encouragement from God's Word in 2 Timothy 2:10 which says, "For this reason I endure all things for the sake of those who are chosen, so that they also may obtain the salvation which is in Christ Jesus and with it eternal glory." Have a wonderful week.